easily and inexpensively replaced when damaged. 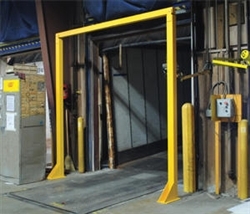 Guard will not interfere with overhead door. Complete unit is painted high visibility OSHA safety yellow. Concrete installation kit available. Custom sizes available. DWB-ABK Wedge Anchors for Concrete Installation - Qty. 8 1/2" x 6"